Justin Trudeau’s family is at it again with another year of delightful Halloween costumes. 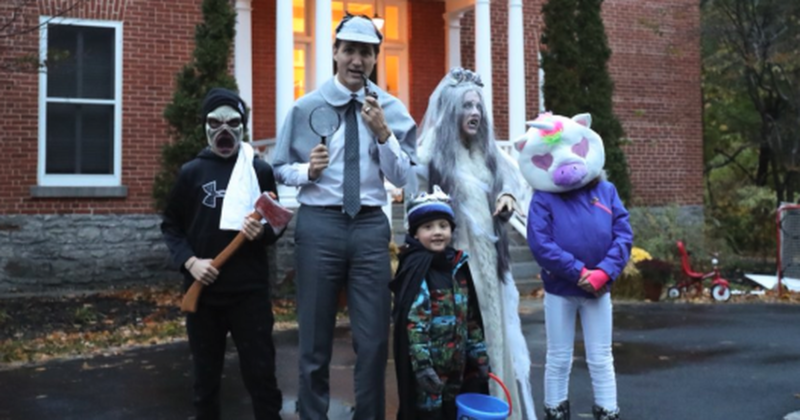 Canada’s prime minister dressed up as Sir Arthur Conan Doyle’s beloved character Sherlock Holmes for the spooky holiday, donning the fictional detective’s signature deerstalker hat, pipe, and clue-hunting magnifying glass. Trudeau joined his son Hadrien to go trick-or-treating at Rideau Hall, the home of the Canadian governor general, HuffPost reports. The prime minister’s proven quite the Halloween enthusiast over the years, dressing up as a rather self-aware Clark Kent/Superman in 2017, pairing with Hadrian as the Pilot and the Little Prince from the classic French tale in 2016, and as Han Solo in his get-up from The Empire Strikes Back in 2015. While it’s likely not the reason for Trudeau’s choice of costume, the prime minister dressing up as the pipe-touting Holmes seemed a timely moment to folks on Twitter, as Canada became the second country to legalize marijuana on Oct. 18. Yeah why not? It’s legal now.